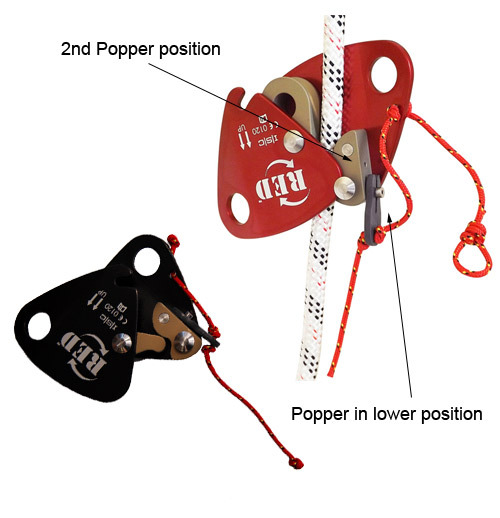 ISC RED Back-up Device with Popper (designed primarily for Rope Access) – For use with a cowstail of up to 800mm (with karabiners) from the central waist attachment point of a harness. The ISC red back up device has non-aggressive cams and a positively locking spring which means the device is ‘self-parking’ rather than ‘self-tailing’ like many rope grabs (it stays in position rather than drifting down the rope!). – Using ‘Rotational Braking’ the more the device rotates clockwise the more friction is built up and this provides an automatic brake even in the event of a sudden pull on the cowstail (such as if there is a mainline failure in Rope Access). – The Popper version of the device is a breakaway clip which provides a secondary attachment point for the tow cord and allows the user to tow the device directly downwards without unintentionally engaging the device’s rotational braking system. However when the cord is pulled in a panic situation, the Popper clip releases under the force and the cord then works in conjunction with the rotational movement of the braking system. For full details and the manufacturer’s user instructions please click here.